Be apart of it all. 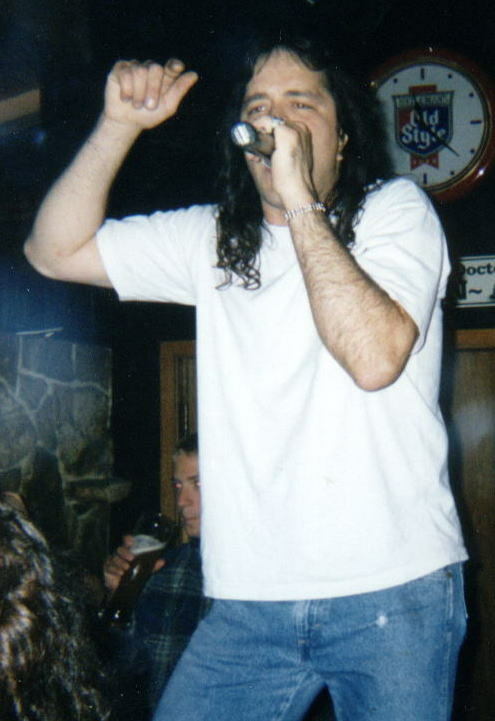 Photo taken on 7/3/97Singing at "Tomorrow California" during the "DEUCE-EX BionK ThE ReST" TOUR "97"
This was taken the same night Rick was abducted by the sewer people. A few people in the audience swore that they saw several ghostly figures floating around Rick. I personally saw him disappear for a brief moment and I also saw the hands on my watch spin backward. A local newspaper man photographed what looked like ghostly figures floating around Rick. When I saw these pictures chills ran up and down my spine. Everyone began pointing at them and Rick did not notice because (he told me latter) he was concentrating on a female in the crowd who seem to be floating! Since this show, there have been ghost hunters at every Rick performs! No one knows for sure knows what happened on that night and no one else saw that for one brief moment Rick had completely vanished. This article by Hellcat: Local beat reporter for Les Fleur Sauvage. You should hear these two play the blues! If your are lucky you can catch them at the blues jam in Kenosha, Wisconsin. Rick and the "Pink Elephant" the FIRST Duece Ex equipment van. If you saw this florescent pink van going from side to side almost out of control, the passengers aboard were playing a game. They were seeing who could keep their balance the longest and be the last one standing won the game. It was in this van that Rick almost lost his life. Rick fell asleep while writing poetry by candle light .The candle must have fallen causing the van to go up in flames. Luckily Bonsai pulled Rick out before any injury. This van was painted by the Rhodes (the equipment managers for the band) and eventually own by the Rhodes. On it's last safari the Rhodes drove it to a concert . By this time the Pink Elephant average speed was about 19 miles per hour. Smoke that came from it's tailpipe was so bad that you could see it coming from miles away! It looked like mystic smoke signals calling out to the cosmos. 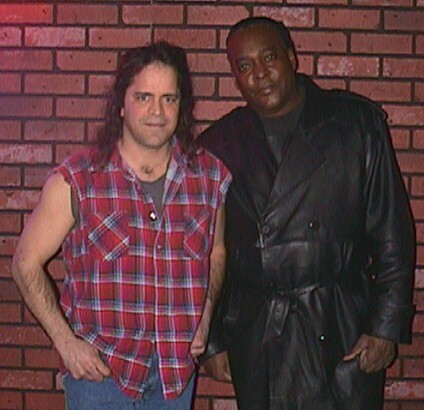 The "DUECE X" logo was painted by Rick the drummer. When this van came into the scrap yard and using the crane, they held it up high and shook it until the chaise fell from it. Then they ripped it open like a can of sardines! CLICK HERE FOR MORE PICTURES AND STUFF ABOUT Rick Sentieri WHO LIVES IN KENOSHA WI Click here to find out ways you can help this web-site.